A small round charm and a thin pendant enrich the 18K yellow Gold necklace’s delicate silhouette. Like two shiny stripes, the monili rows illuminate the face with delicate golden reflections. Set in the clasp, a round 0.015ct Diamond completes the jewelry with an “invisible” detail of sophistication. The 18K yellow Gold jewelry was created and handcrafted in Umbria, the Italian region that is home to the village of Solomeo. The 0.015ct Diamond which embellishes the clasp is a round cut. Two fine rows of 18K yellow Gold monili represent the iconic element of the Brunello Cucinelli collections: each row is made up of small rounded beads with a faceted effect. 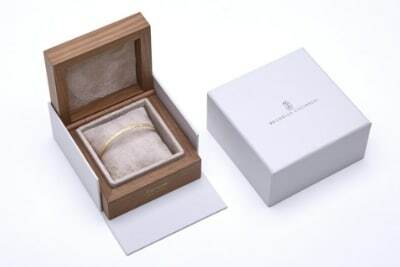 All 18 kt gold jewels come with a special packaging exclusively designed and crafted in Umbria for the Aurum line. 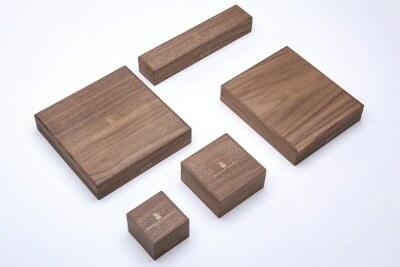 For utmost protection, the packaging comprises a fine wooden case, nestled in a rigid paper box.